Holidays. Just say the word and for many of us it brings to mind parties and fun, trees and sparkly lights, decorating and packages, time with friends and family. But for some, it means bittersweet memories and tears, forced smiles and avoidance, noisy crowds and irritation. I talked to two different people today that mentioned difficult holiday emotions. For one, this is the first try at Thanksgiving and Christmas after losing a spouse. The other is facing the 3rd round of navigating the holiday season. Both are facing some difficult emotions. The first holiday season after Terry died is a little blurry in my memories. Our loss was still just weeks old when we were faced with Thanksgiving. Christmas followed close behind while grief still had a stronghold on our lives. Thankfully, we were staying with a friend and spent the actual holidays with family, so decorating decisions were a non-issue. The following year we spent Thanksgiving in Oklahoma for a wrestling tournament. My only concession for Christmas decorations that year was a pre-lit, six inch tree. In 2008, Gracie wanted to do Christmas right. I wasn’t sure how to face the memories, but I was determined to fulfill her request. I decided to stray from the traditional decor and go outside of the box. Every color my mother said wasn’t “Christmasy” was now on our tree. We bought pink, purple & lime green feather boas to use as garland. If it was hot pink, purple, orange or green, it was a decoration for our tree. We used flamingoes, glittered Santa’s and a few teddy bears from previous trees. 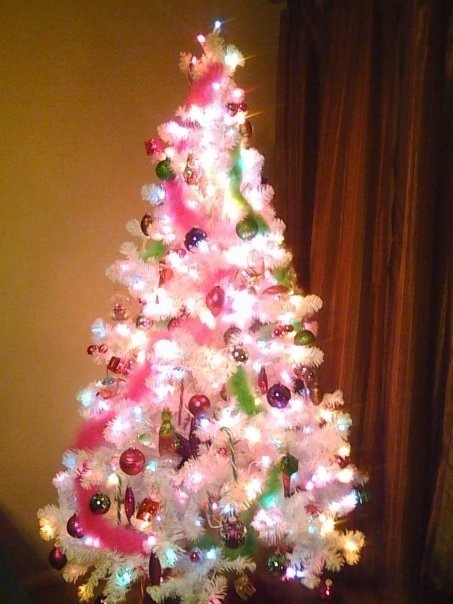 The tree skirt was a hot pink sequined scarf. I even had two 4 foot tall stuffed flamingoes that stood guard. The only things banned from our tree was the traditional green and red. It was a new look at Christmas for us. As the years have passed, more of the old ornaments from past years have been added. We make the cookies and peanut brittle and snacks that Terry loved. And we’ve added some new recipes. I’ve decided it’s okay to eat out for the holiday meals. Not having to worry about cooking the perfect meal relieved a lot of stress for all of us. We’ve kept a few things in our holiday traditions and added some new things. It works for us. If you know someone that is facing the holiday season with more dread than joy, don’t avoid sharing your holiday excitement. Invite them to be a part of your holidays, whether it’s a party or a program at church or a cup of a special holiday coffee. And don’t be offended if your offers are refused. Keep offering. Because someday, they’ll be ready to share your excitement and joy. It will just look a little different on them. I have always been a bit of a mother hen. I watch what goes on around me and try to take care of those that I can. It comes naturally for me. So, it’s difficult for me when I am the one needing care. Last week was one of those times. Last week we were finishing up our weekly AWANA club meeting. The room was warm and the active group of kids just made it warmer. We were playing the quiet game with our Sparks while we waited on their parents. I was supervising. As I was sitting in the front watching the game, the room seemed to start moving. The longer I sat, the faster it went. I realized that I needed to do something before I passed out in front of the children. I asked Mrs. Mickie to keep track of the kids and went to the back of the room. From comments that were made later, I think my skin tone could have been described at pasty white. Mr. Wayne watched me sit down and began to ask questions. He quickly got a cold drink and some cool towels for me. I’m sure I looked very lady like sprawled across the row of chairs, but the floor was the only other option. After cooling off and getting some sugar into my system, my world was right again. Things stopped spinning and I could carry on a conversation. As the room stopped spinning, it was very humbling to see the concerned faces surrounding me. Through the weekend, others have made a point to check on me. I’ve been asked all sorts of questions about what happened and what might have caused it. There have been some doubtful looks and some head shaking as I have brushed off the concerns of other issues. I have been the recipient of true caring from my friends. I am again reminded that it’s okay to need others. And, I am very grateful. Often n my efforts to prove that I am a strong and capable woman, I am able to forget that I need the caring of others. I’ve been a widow for eight years and I continually fight my mental picture of what a widow is. I grew up to think that widows were old, helpless and dependent. I’ve worked hard to prove that I “can do this!” I’ve tried to be everything that my children need in order to make up for missing their dad through their teen years. I’ve tried so hard to never show any cracks to anyone, that I sometimes convince myself that this is the “real” me. I tell myself that I’m on my own and I don’t need anyone else. I refuse to think about how much I need the love and care of others, how much I actually crave it. And then the room begins to spin out of control. And the I remember: I just need to open my eyes and let the room stop it’s spinning long enough to notice that others do care. Fear. We all suffer from it. We all deny it. Too often, fear dictates the decisions and choices made throughout life’s journey. Fear may be judged rational or irrational, but it is still fear. I have a phobia (a PC word for fear) of phones. Not talking on them, but calling others on the phone. I don’t know why. For as long as I can remember, dialing a number to call someone on the phone made my stomach hurt and my hands sweat. I love to talk on the phone. As long as I’m on the receiving end of the call, I can talk for hours. Part of my fear is getting a wrong number. Part of it is disturbing the other person. But, mostly its an irrational fear that the person on the other end is just being polite and doesn’t really want to talk to me and is making bored/annoyed faces on the other end of the line. I’m sure there have been many lost opportunities in relationships because I avoid making those phone calls. This carries over into my life today. I can TEXT anyone. And, I still avoid actual phone calls. Although it is not often addressed as a fear, most people avoid failure. As I was growing up, I was very careful to only attempt things that I was pretty certain would be a success. I made every band for which I ever auditioned. I didn’t play sports because I didn’t think I would be good enough. I probably missed out on some fun experiences because I didn’t want to fail or look silly. One big fear that I see in almost everyone is fear of the pain caused by rejection. We all want to be liked. We pursue love and acceptance throughout our lives. The fear of being rejected can inhibit and greatly hinder interactions with others. We build walls to protect ourselves. We may allow others into our sanctuary, but even then we restrict how far they may go. Very few people have ever made it behind my walls. Unfortunately, some of the people I invited to peek behind my walls were not good choices. They left damage in their wake. And, as a result, I’m more guarded than ever. The only way to avoid being rejected or being hurt or failing is to never allow the opportunity to exist. Life can be incredibly lonely and boring if you do this. Some of the deepest hurts I’ve ever experienced were from the same source as some of my greatest joys. To eliminate the hurt and pain inflicted by others, you often must forego the joy and happiness also. The trade-off isn’t equal and it’s not worth it. I have to conquer my fears. I must move forward and take risks in order to live my life fully. I will not always succeed and fear will still exist, but. . .
We celebrated this weekend. The focus of the celebration was the Twenty-Fifth anniversary of my pastor and his wife at Westland. But, I celebrated a lot more than that. I celebrated the children that have grown into wonderful young adults through the years at Westland. Some of them are now raising their own families. I love watching the generations grow. I celebrated memories. Memories of the last 17 years at Westland and the people who have passed through the doors. Some as quick blips in my life, others that have made a big impact and then moved on their way. I celebrated the God Strings that pulled us all together, weaving our lives into a tapestry that is as unique as it is wonderful. The tears, the laughter, the coming and the going are all elements that have shaped my life. I pray that the rest of my life is as full and rich with the treasure of friends and family as it is today. We say we want it. We say we live in it. And yet, it seems that we often shy away from the truth. Whether it’s by dying our hair or just not saying anything to “upset the apple cart”, we don’t always stand by the truth. The true is straightforward. The pain comes in straightening the bending and winding paths we are following. The truth is light. And light exposes those things we aren’t always comfortable with displaying. The truth means being honest about one’s feelings and ideas, dreams and goals. If I cannot be honest with myself, how can I share truth with others? Our world bends the truth, grays it out, and hides it behind words that mean nothing. When truth becomes uncomfortable, we “change” was is true. And truth becomes unrecognizable. We must decide to stand by truth. And it starts with being true with myself about my life, my dreams, my goals. Reading through the last month of posts, one would get the idea that I’m an unhappy person. I’m not. Most of the time. I am truly blessed. I don’t live a charmed life where everything is wonderful and rosy, but I have received more than my share of blessings. Sometimes, I let the sadness creep in and forget everything else. I have a wonderful family. My parents loved me and were always supportive of anything I wanted to do. I was blessed to have my dad around until about 6 months ago and he just missed celebrating 55 years of marriage with my mom. I thought everyone grew up with a family similar to mine. We were the norm. And then, I went off to college. That’s when the reality of divorce and blended families came into my life. I was an adult before I was aware that not everyone liked their families or were even welcomed by them. It astounded me that parents could just cut their children from their lives for any reason. When I married, I became painfully aware of what it meant to be part of a dysfunctional family. So, I am very grateful for the blessing of my mom and dad and brother and sister. I was blessed. By the time I reached my late twenties, I had decided that marriage was not to be part of my life. I was making plans to go to seminary and move on with my life. And then Terry made an entrance. I had met him a few years earlier when he served as interim Youth Minister at my church. I was interested in getting to know him, but he didn’t return the interest. Three years later, he once again stepped into the interim youth position. This time, I was determined to ignore him completely. I had other interests. Then one day, I realized how childish I was being. We were married seven months later. It wasn’t always easy sailing. We had some rough patches. And, through the years, I learned to appreciate Terry’s quirky sense of humor. I let go of my expectations and embraced what was real. Terry truly became my best friend. We talked and laughed and cried. We raised two kids together and lived vicariously through them. Life was messy and busy and hectic and wonderful. We were blessed. And just as quickly as we started our life together, it was over. Terry died from complications of pneumonia and I believed everything else died with him. I didn’t understand how the world could keep spinning. I resented other couples. I resented happiness. I begged for all of the pain to end. I was angry and hurt and confused. And, God never left me. Even when I couldn’t feel it, there was hope. I had friends that came along side me during the darkest days and carried me. When I couldn’t remember how to breathe, someone was always there to remind me. My son and my daughter were often my only reason for getting up in the morning. We grew closer because of our grief. And even in the pain, we were blessed. As I have learned to live again these past eight years, I try to remember the lessons I’ve learned. I try not to put off telling those around me that they are important to me. I say “I love you!” whenever I can to my kids and to my dearest friends. Because I am acutely aware of the loss of my best friend, I’ve learned to truly treasure my closest friends. BFF is a term that is bandied about way too much, but I have learned the value of that Best Friend. I’ve been told that I’m a bit obsessive about my friends. And maybe I am. But, I never want to miss the chance to share the blessings of friendship and love. I don’t know how many days I have and I want to make the most of the blessings that God has give me. I want to show love quickly and passionately. I want to spoil and pamper those that I love. I’ve lived a life of “wait until later” and later will never come for us. I don’t want to waste another moment. I am blessed.